Our early childhood series has been covering the importance of good nutrition for your baby’s brain growth and development, starting with the magic of mum’s breastmilk! We’ve explained why babies up to 6 months should ONLY be given breastmilk, and then how you must give your little one a healthy, nutritious diet from 6 months so his or her brain and body can grow in the best way possible. Introducing new, different, healthy, nutritious foods to your baby and young children is very important. And the fresher the better! Fresh food is much better for baby (and all other members of the family!) than baby food pre-prepared and sold in containers in shops. Grow your own vegetables if you can! This is how you can set your children up for healthy lifestyles and well-functioning brains! Take your young child regularly to clinic for growth monitoring. Health staff weigh your child, measure his or her length/height and plot these on the graphs in your child’s Road to Health Booklet. This tells them and you, if your child is growing well. While we know that malnutrition, under-nutrition and poor growth in babies and young children are very serious problems in South Africa, we are also seeing an increase in obesity and over-weight children. Obesity and over-weight are also serious health problems as they too indicate poor or incorrect nutrition. Obesity and over-weight are caused when children are fed ‘empty’ foods – foods like sweets, biscuits, cakes, fried hamburgers and chips and sweet fizzy drinks full of sugar. These foods fill children up but provide little or no nutrition. Nutritious diets include plenty of protein (meat, fish, chicken, eggs, liver, legumes); whole grains (whole-wheat bread, brown rice); starches (potatoes, sweet potato); vegetables (pumpkin, butternut, spinach, morogo, imifino, cabbage, kale, beans); fruits (apples, pawpaw, mango, banana, oranges) and dairy products (full cream milk, yoghurt, maas, cheese). Don’t overfeed your child or force your child to finish everything on her plate. Feed only nutritious food, then let your child’s appetite guide how much he eats. Young children need a nutritious diet, plenty of clean water to drink, enough sleep and lots of exercise as they play climbing trees or jungle gyms, jumping rope, riding bikes and running around playing games with other children. Obesity and over-weight in children can lead to a life time of ill health as it puts children at greater risk of diabetes, heart disease, strokes, asthma and cancer. It also has psychological effects and can lead to low self-esteem, poor body image and depression. If you are worried that your child is over-weight, do seek help from health staff. It is much easier to get it right in early childhood and set your child on the path to health and happiness. Young children learn through play and need play and early learning materials. These don’t need to be expensive toys and many can be made from everyday objects. Barrows, a company that does printed materials for RCL FOODS, is printing early learning materials in the wasted space of the company’s promotional materials. RCL FOODS, in partnership with Innovation Edge, ensures these materials get out to early learning programmes in communities. 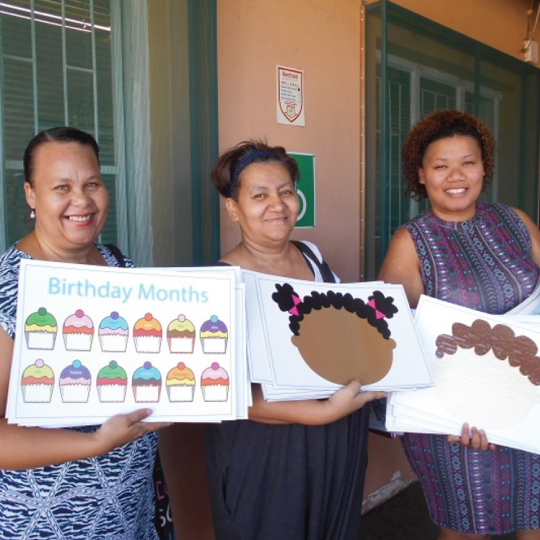 Learning materials are distributed to teachers and playgroup facilitators at the monthly ‘Every Word Counts’ workshops in Worcester.